I feel like a broken tape recorder every time I post and go 'this is my favorite nail polish' but it's all true and today I have another favorite to show you. 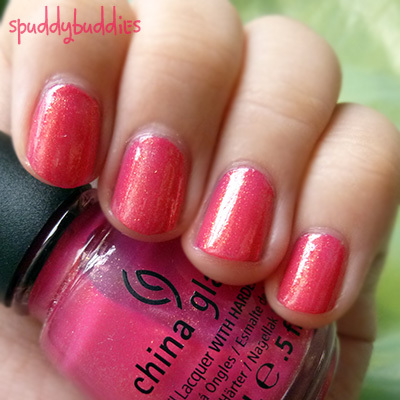 This beauty is China Glaze - Strawberry Fields. It's on their permanent line so never fear, go grab it; I got mine at Sally Beauty. Strawberry Fields is a pink jelly-like polish with beautiful gold shimmer. The gold shimmer is what makes this polish so amazing. I have never seen anything like this before. The formula was lovely and the application was smooth but the coverage was slightly sheer on the first coat. I used 2 coats here to make sure there was no visible nail line. I would be lying if I said that this wasn't my favorite pink polish with gold shimmer. It's so beautiful, I could stare at it for hours. I have to say, I was also attracted by the name. Like, Strawberry Fields. Could a name get more visually pleasing to the mind? So pretty, I love that and it's a flattering colour! Love this colour! Need to get my hands on a bottle asap!